The 2019 celebration of legendary country musician Johnny Cash in Port Richey will be held Feb. 26 at Gill Dawg Tiki Bar and Grill. PORT RICHEY – Legendary singer-songwriter Johnny Cash would be celebrating his 87th birthday next Tuesday, Feb. 26. Famously known as the Man in Black, Cash will be posthumously celebrated for a fifth consecutive year in a town in which he spent some of his days. Cash’s connection to Port Richey came through his in-laws, Ezra and Maybelle Carter, who owned a home on the Pithlachascotee River. Cash, who died in 2002, married country singer June Carter, Ezra and Maybelle’s daughter, in 1968. 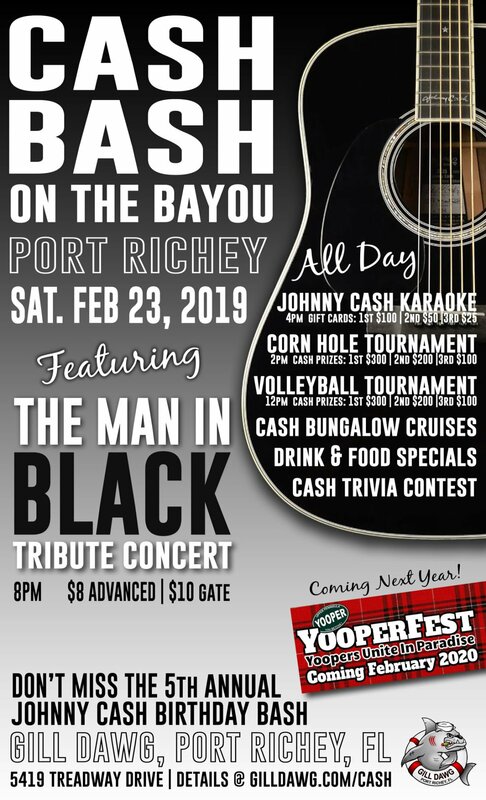 Gill Dawg Tiki Bar and Grill, 5419 Treadway Drive, will present the Cash Bash of the Bayou, featuring the Man in Black Tribute Concert Birthday Bash 7:30-11 p.m., Saturday. This year’s event includes a Karaoke contest featuring Cash’s music, a Johnny Cash trivia contest, team corn hole tournament, two-on-two volleyball tournament and drink specials inspired by the country music icon.